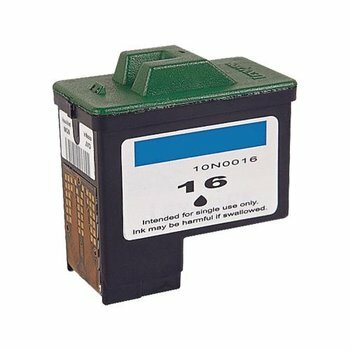 A compatible Lexmark 10N0016A black inkjet cartridge 410 pages approx. (also known as 10N0016, Lexmark number 16, No.16 and #16). Lexmark X75, X1140, X1150, X1170, X1185, X1195, X1250, X1270, X2250, Z13, Z23, Z25, Z25LE, Z33, Z35, Z35t, Z511, Z513, Z515, Z517, Z603, Z605, Z611, Z615, Z617, Z645. Nexis 100AP CD Duplicator X74 Z35LE Z600.